#043 How To Continue A Conversation in English When You're Stuck? Today I’ll tell you how to continue a conversation in English when you’re feeling stuck or blocked. Later you’ll practice your speaking with a funny mini story. The story is about a very handsome young man who flees to an island. 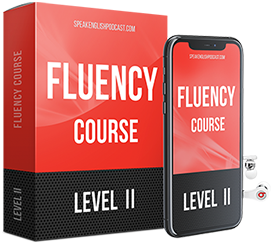 You can finally learn English in a fun and effective way, only by listening! Please help me to spread the word by sharing it with your friends and family or by writing a review on iTunes. That means a lot to me. Thanks! Have you ever wanted to talk to someone for longer, but you got stuck because you didn’t know what to say anymore? When we speak a foreign language, we’re often, afraid to start a conversation or to ask questions. We’re worried that they won’t understand us or that they’ll merely lose their patience as we try to formulate our sentences. If you still don’t know how to continue a conversation in English you’ll need to learn, or the communication will just end much too soon. And you might not get a second chance to talk to that person anymore. You can’t always rely on the other person to make all the effort and keep the conversation going. That’s exhausting for many people and they may decide not to talk to you again! Despite not having a very high level of English you have no excuses. You must learn to be a fun and enjoyable talker and don’t worry; I’ll teach you some tricks. It was really NYC once.! I’m happy that you liked the lesson! Have a nice day! This is a awesome method to learn English. I am fascinated with it.